We’re celebrating our 10th annual Festival of Fruit on Saturday, September 24, 2016 from 10:00AM to 2:00PM. Come enter a pie (or other baked treat) for the contest. Not sure what the cause was, nor exactly when this happened, but our only Belmont apple tree in the northeast corner of the orchard has fallen over. It’s totally loaded with apples (as are many of the other trees). We’ll have to see if it can be pruned and righted. Everyone is welcome to join our summer pruning and orchard maintenance work party on Saturday, August 6th from 10:00AM – 2:00PM. Did you know we have grape vines in the southeastern corner of the orchard? These are varieties which were grown in the area when Piper’s Orchard was originally planted, though we don’t believe any vines were planted here at that time. Here are some developing Gewurztraminer grapes. Probably not enough to bottle this year. Come visit Piper’s Orchard in Carkeek Park Saturday, and see Joseph Anderson’s one-day only Orchard Oculus exhibition, as well as our ripening fruit trees and grapes. We have a nice dolgo crab-apple in the orchard, which ripens earlier than most of our apples. The dolgo is sweeter than many crab-apples, and is listed a good for making jelly, but I can speak from personal experience that there’s a lot of overhead if you’re trying to include them while making applesauce. You can learn more about the dolgo at Orange Pippin. The other day I took a couple of pictures of one of our Red Astrachan apples. The variety originated in Russia. 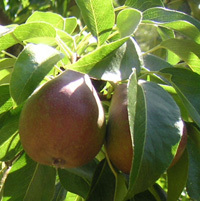 For more information about the variety, you can visit the Orange Pippin website. To find out where ours are located, you can check out the orchard map. Heading through Carkeek Park recently, I saw an apple tree along the trail in the lower meadow between the road and Piper’s Creek. It’s been there quite a while. Got these pictures this morning. It’s likely a seedling volunteer. Perhaps we can bring an apple from it to the Festival of Fruit on September 24th for apple identification. Mark your calendars now for the Festival – just 3 short months away!